A neighbor in Lakeview East has shared images of a man who burglarized several areas of a lakefront high-rise building on July 12th. 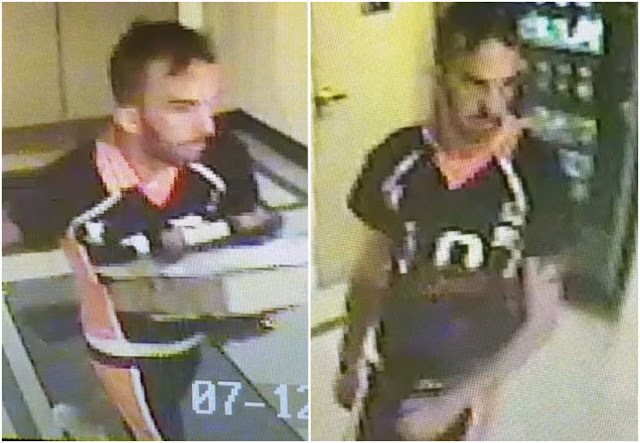 The man seen here entered the building in the 3500 block of North Lake Shore Drive by posing as a traveler who was staying with a resident, according to a CWB reader. He carried a backpack and pulled luggage to complete the look—and to help him haul away booty, we suspect. Once inside, he broke into a dry cleaner and stole cash, took packages from the receiving room, and tried to take money from a vending machine, the reader said. After that, the man broke into the building management office. The suspect is described as a slender white male, about 35-years-old, with a heavy black tattoo from his right wrist to the elbow and a cross-like tattoo on the left bicep.